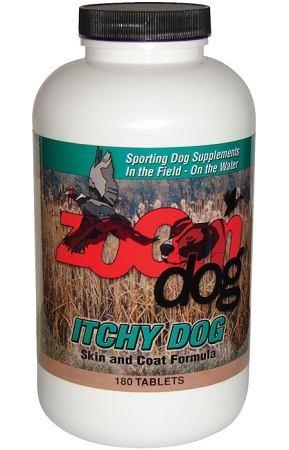 Everything you love about Itchy Dog in a larger bottle count! Vegetable based beef and bacon flavoring. Any dog, no matter the breed or size, can have problems with their skin & coat or allergies. They can happen during different seasons or year round. Spring allergy season or dry air in the winter from indoor heat are just a few examples of when dogs may have problems with their skin & coat. A dog that trains, works or hunts and often lives outdoors will be exposed to more environmental allergens. Their high activity levels while they are working will also stress their bodies, so extra nutritional support is important. Dogs that live indoors and are family pets can also benefit from Itchy Dog if they have any skin, coat or allergy problems. Double the recommended usage for the first 5 days. Administration may be divided into a.m. and p.m., if desired. During allergy season, the amount of tablets you give your dog can be increased, if needed. Try adding one tablet a day to help your dog feel better. This item has gotten a dog that was chewing his feet and legs to the bone off Prednisone completely. I would recommend Itchy Dog to anyone and am going to tell my vet how wonderful it is. My 1 year old Great Dane had suffered red, raw, itchy feet, of which he bit and licked constantly. I took him to 3 different Veterinarians, that were ALL stumped, even after prescribing antibiotics, cortisone creams and pills, medicated shampoos, and changing his diet several times. I was at my wit's end, until we ran into a couple on Kelly's Island,Lake Erie. They told us to give zoom dog supplements a try. He is doing fantastic! He LOVES the "treats" and is now on his second bottle. Whatever is in these are just the ticket! Ricky says "THANK YOU, THANK YOU!!" Our one dog is allergic to pretty much everything in life, and also has very sensitive skin that is affected by our extremely dry air in Colorado. These pills have been a lifesaver for her and have greatly reduced the amount of itching fits and hot spots she has. They also must taste great, because we have never had any problem with either of our dogs taking them, when they are usually picky about every other type of tablet. So glad we found these! Our dog Zeus had allergies from the time we got him at 9 weeks old. He is now going to be 5 in a few days and has been on Itchy Dog for years and is doing wonderful. I have recommended this product to quite a few friends and they love the product as well. So worth it to see our lil guy feeling much better.